Congratulations to Michael Chow on winning the Nathan Mendelsohn prize for the highest ranking student at a Canadian university in the Putnam Mathematics Competition for 2017. Chow has participated in the department’s Undergraduate Mathematics Competition, placing first 2016, 2017, and 2018. He was also part of the Putnam team representing UofT which came in 4th place in 2017! Chow graduated with High Distinction from the Honours Bachelor of Science program this June 2018. We are proud of his achievements! Alex Song, perfect IMO scorer in this year’s competition, and Jacob Tsimerman, faculty member here in the department, were interviewed by Canada AM this morning on their success in this year’s International Mathematics Competition. Congratulations go to our Canadian IMO team which last week took 9th place in the contest out of 104 participating countries. In addition, team member Alex Song received a perfect score on the contest (the only student to do so). The team was lead by the Department’s own members Lindsey Shorser and Jacob Tsimerman. Participant Michael Pang attended the Canada Math Camp in 2012 which was hosted here in the Department and is sponsored by the Canadian Mathematical Society (CMS). The CMS also supports the Canadian IMO team each year. We are very proud of this year’s team, congratulations to them all! Further details can be found on the CMS press release. Department members Jacob Tsimerman and Lindsey Shorser are spending the last two weeks of June in Banff training Canada’s IMO team for their competition in Chiang Mai, Thailand, from July 4 to 16, 2015. The team is hard at work preparing for this year’s contest. Canada has participated in the IMO since 1981. 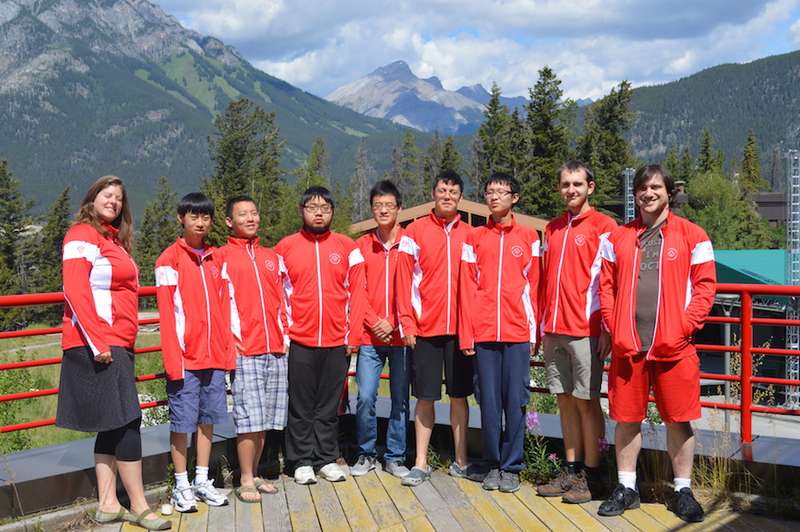 Last year, Math Team Canada placed 9th overall at the IMO in Cape Town, South Africa. The CMS is responsible for the oversight and training of Canada’s Math Olympiad Team. The CMS notes recently ran an article written by the board members of the Canadian Math Kangaroo competition detailing the potential competition like this have for popularizing the field of Mathematics for our up-and-coming mathematicians. The article provides an overview of the competition, sample problems and background on the competition. It also talks of how the competition helps to involve and inspire students to be involved with mathematics in a context outside the typical classroom. This year the GTA section of the competition saw over 900 students participate across the three UofT campuses (UTSC, UTM and St George) and had over 50 staff and students volunteer to make it a success. … and Silver and Bronze! This year’s Canadian IMO (International Mathematics Olympiad) had a clean-up year for medals at this year’s competition. The team, coached by Lindsey Shorser (an instructor with the Math Department), along with David Arthur, Ralph Furmaniak, and Alex Fink, won 6 medals (one for each of the team members). In addition, the team leader was Jacob Tsimerman, who was a former U of T undergraduate math specialist. In total the Canadian team walked away with 3 gold medals, 1 silver and 2 bronze medals. This success ranks Canada 5th in the world out of 100 countries which is the best standing Canada has received since it started participating in the IMO in 1981. Our congratulations go to the team, its leaders and its coaches! Great work!